This morning, I joined our club President (Rotary Club of Taguig Fort Bonifacio) Niel Antonio and potential clubmate Eric Lucero, in going to a remote barangay in Boso-boso, Antipolo, Rizal. Niel's company will donate solar panels to that barangay which until now has no electricity yet. 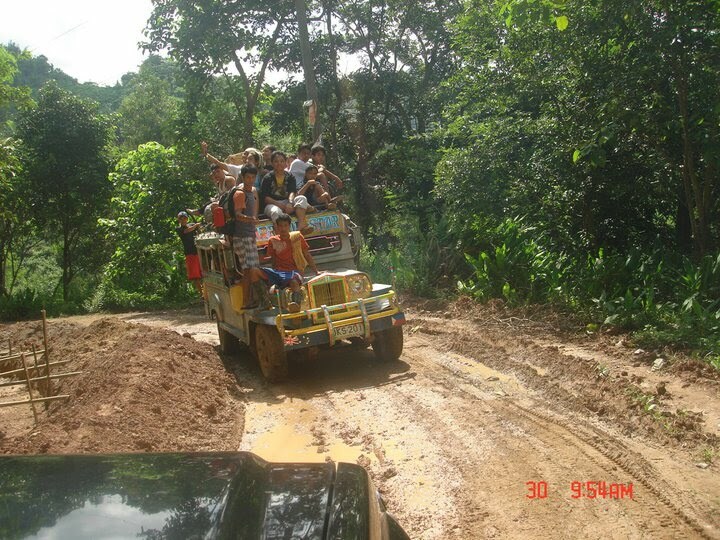 This will be a club project for the indigenous people, Mangyans, who live in that part of the Sierra Madre mountains. We will go there first to meet the barangay captain or village leader, other barangay officials to schedule a turn-over ceremony. 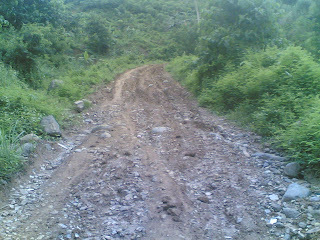 The road going there is bad, one would need a 4x4 vehicle with big tires to hopefully deal with the situation. 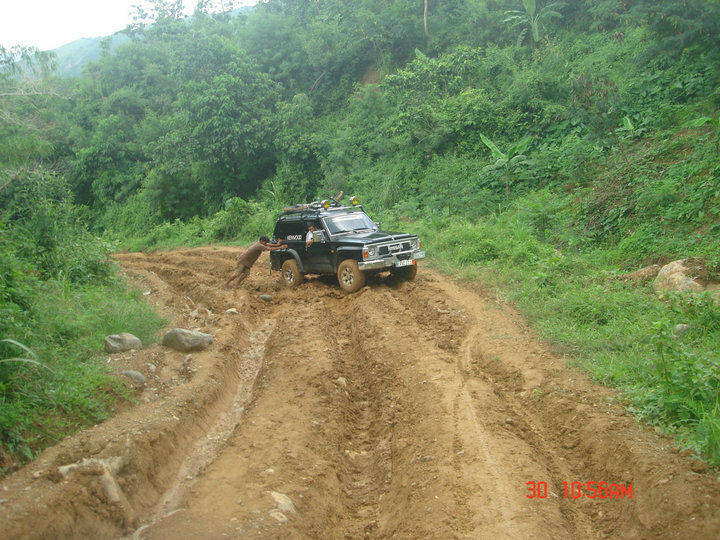 In many mountainous barangays in the Philippines, barangay roads are generally ugly. Exceptions are the barangays in big and famous mountain cities like Baguio and Tagaytay. Eric's 4x4 vehicle had difficulty negotiating the road. The engine was powerful, but the tires, though big by most cars' standard, were still not big enough for the deep canals created by flash floods. It's good that there were many barrio folks who were going home and were walking up. They helped us get Eric's car out of the deep mud. 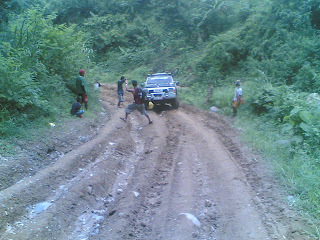 We had to cancel the trip as we pitied the car and we lost time just negotiating the bad roads. 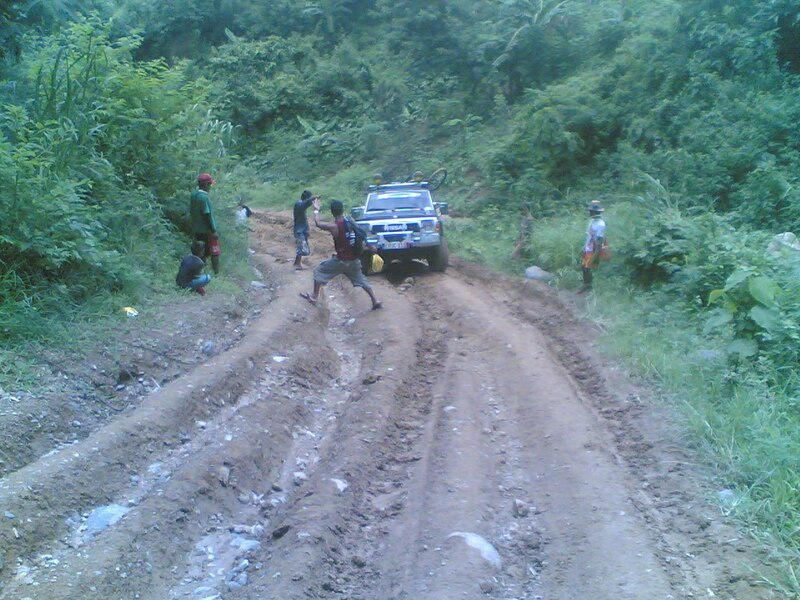 Even if we can tackle that part, we still have to walk for at least 30 minutes to reach the community as the bad and muddy roads will show up again up there. We will schedule another trip in the coming weeks. By the way, here's one jeepney that we met on our way up. The road is bad, only very few vehicles woould enter the barrio, and people have to sit on top of the jeepney just to catch a trip as the next trip will be several hours away. About solar panels and solar energy, I have no opposition to this renewable energy, I support it. These are technological developments that will add more choices for the people on the kind of electricity sources they can use for their households and community structures. What I oppose is when governments subsidize the manufacturers of solar and wind farms purportedly to "save the planet." If people truly believe in doing their share to reduce their carbon footprints, then they should patronize those renewable energy sources even without government subsidy. Governments have no money of their own to allocate and dispense subsidies, except what they take away from the pockets and savings of the taxpayers. This is the solar panel that Niel's company is importing and selling here. It's cool, it's relatively light. From left to right: Niel's helper, Niel, me, Eric and Niel's other helper. Finish. Solar energy is free and enough to use . If solar energy is used at a large level than after effects global warming can be reduced up to a great extent. We need not to depend on fossil fuel , renewable energy resources are the best way to provide energy as they are Cost Effective and Environmentally Friendly. Hi, as I said, I have no problem with solar or wind or biomass or any other renewable energy, I support them. They expand the choices for energy consumers. What I do not support is when governments come in to over-tax the public and subsidize solar, wind, other renewables. If people really want solar, then they should pay for it. It is wrong for governments to over-tax the rest of the public to subsidize solar energy. It's climate rent-seeking. Thanks. In the case of using solar panels at home, the roof would be the ideal choice for the solar panels. How much your solar panel cost and how many households it can provide electricity? Hi, it's my friend selling solar panels, not me, so I dont know his price, also how many houses or lights can be powered by one panel. Yes. It's Very Informative Post..Solar energy is the renewable source of generating power..The family believes the solar panel system they have will last another 30 years giving them free energy for what may amount to the rest of their lives...For more details visit solar power.. Solar Energy is the best renewable energy resource and it helps to generate the electricity.